Adventure sport is not everyone’s cup of tea, but even those who indulge in some of these sports like parasailing, jet-skiing, surfing, paragliding, river-rafting, rappelling, cliff diving etc. do a double-take when there is a mention of bungee jumping. This gravity defying sport is definitely not for the faint-hearted and requires a certain wild streak and free spirit. However, one also needs to ensure they undertake this sport at destinations that comply with all safety procedures and boast of an accident-free track record. Up until a few years ago, adventure enthusiasts had to experiment with bungee jumping at foreign locations only. However in recent years, there are several destinations in India which offer this sport and are known to be safe and compliant with all requirements. One can undertake this sport only if they are over 12 yrs of age and weight 40 kgs or more. 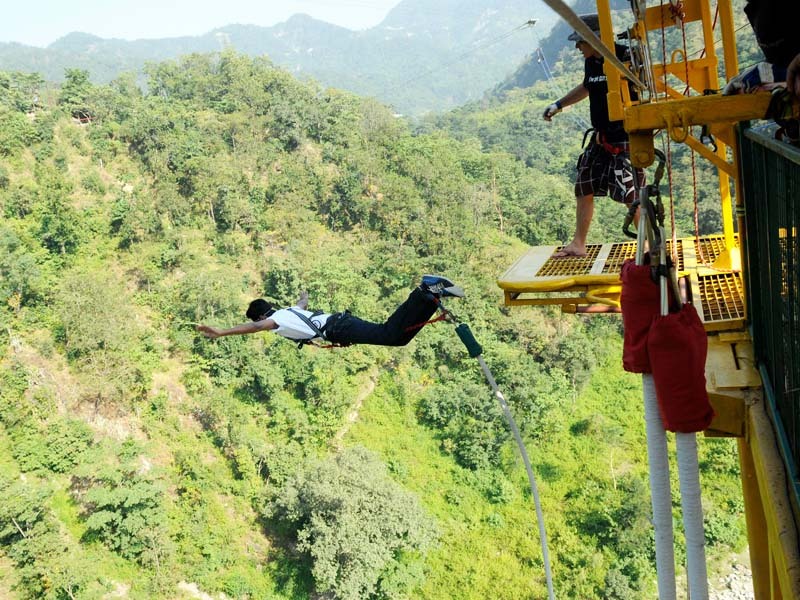 Rishikesh offers one of the most professionally managed bungee jumping sites in India. Located in Mohan Chatti village, just 20 kms from the main city, one can be assured of impeccable safety standards and a stress-free bungee jumping experience. Considered as one of the highest fixed platforms to dive from, a height of about 83 metres, Rishikesh is probably the most expensive place to indulge in this sport. It is also one of the most thrilling and exciting sites to jump off from as the cantilever/ beam is built jutting out over a rocky cliff! Bungee jumping in Bangalore takes place in Kanteerava Stadium. Managed by Ozone Adventures, bungee jumping in this city is conducted from a non-fixed platform. The entire equipment for this sport is attached to a 130 ft high mobile crane, and bungee jumping takes place from a platform held by the crane, suspended 80 ft from the ground. While the management assures you of utmost safety, it is important to bear in mind that bungee jumping from cranes is a bit risky as compared to jumping off a fixed platform. Della Adventures offers the adrenalin pumping sport of bungee jumping, amongst many others, in one of India’s best adventure parks at Lonavala. The equipment for this sport is attached at a height of 150 ft and the whole experience lasts for about 10 minutes. The bungee jump itself takes place from a height of 45 metres. One is also awarded a certificate congratulating you for successfully completing this nerve-racking feat. Bungee jumping is available in our national capital, Delhi too. Offered by the company Wanderlust Tours and Travels, who first introduced Bungee Jumping, as an adventure sport, in India, one can be assured of complete safety and precautions, as top quality equipment has been imported from Japan and all the staff are trained from Germany. This equipment is attached to a 130 ft high crane and the bungee jumping itself takes place from a height of 39 metres. They also offer jumps from a bridge and a tower jump. On successful completion of the bungee jump, the participant is handed over a completion certificate and given a T-shirt and cap, stating ‘I did it’! Gravity Adventure Zone conducts Bungee Jumping near the very popular Anjuna Beach in Goa. With an amazing geographical backdrop at this location, bungee jumping from the 25 mtr high platform, attached to a crane, is thrilling as well as a sheer delight. As the jumping platform is attached at quite a low height, this would probably be a good place for beginners to try out this sport.